Share this product and receive a $8.10 sharing discount. 6 1/2" 7" 7 1/2"
Words cannot really express the beauty of this handcasted and assembled bracelet with scripture. The materials are .925 Silver, gold links, and a flower charm. This popular mix of materials allows this bracelet to be worn with other silver or gold jewelry. This bracelet is available in 6 1/2", and 7" lengths. The hand cast Dew Drop medallion measures 2" in length. The artist is happy to accomodate by providing bracelets of different lengths. Please allow up to 3 weeks for special orders. This particular bracelet has very distinctive raised dots. The backside of the medallion has 'Thy word is a lamp unto my feet and a light unto my path.' 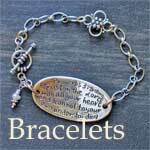 Psalm 119:105 A beautiful bracelet for young and old alike. South African, Ashleigh George has been designing unique and creative jewelry from a very young age. The pieces that we carry are from her Dove Collection which are inspired by the richness of Scripture along with the beautiful and intricate patterns found in nature. 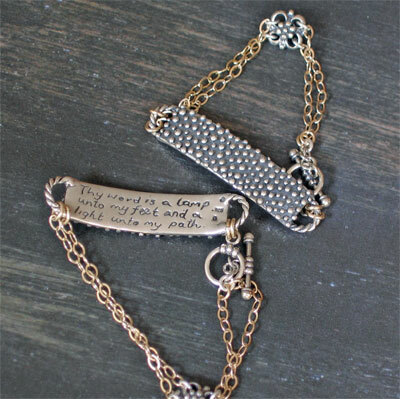 She hopes that the wearer will be inspired and reminded of the true Word of God, and that they will find comfort and strength that these wearable treasures hold.